Habal-Habal (motorcycle taxi rides) provide an alternative form of public transport, and is available throughout the Philippines. We first became aware of this while walking alongside the main road through the town of Loboc, in Bohol. A motorcyclist pulled up in front of us, gesturing to the empty pillion seat, and repeating ‘Habal-Habal!’. 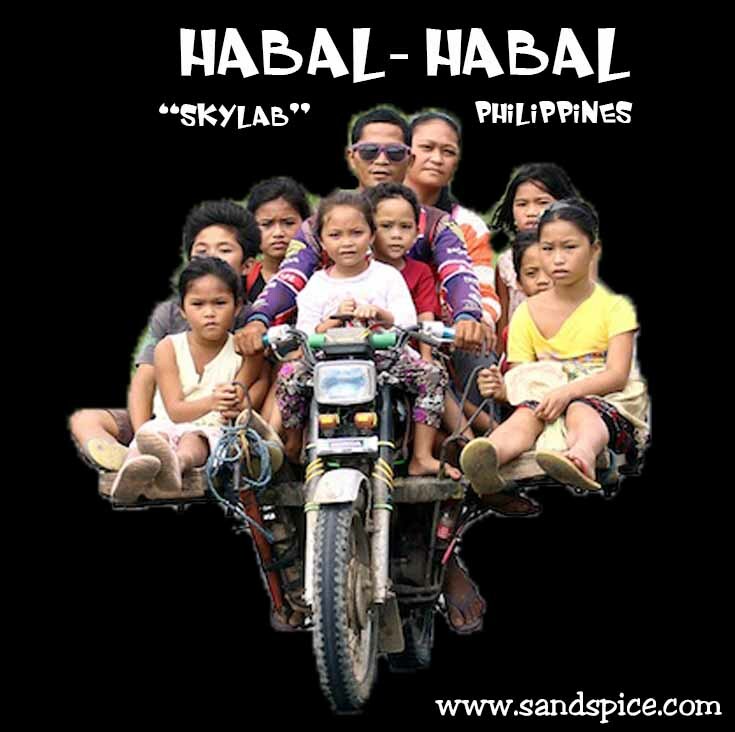 The simplest form of Habal-Habal is a pillion ride for one passenger on the back of a motorcycle. You will sometimes find young guys offering these motorcycle-pillion services outside busy train or bus stations. A sort of private budget taxi service. The traditional Habal-Habal takes the form of a motorcycle with an extended seat protruding over the back wheel. This usually accommodates four people, including the driver, who moves forward over the gas tank for better balance. Exceptionally, a fifth (smaller) person may also sit sidesaddle on the gas tank in front of the driver. The most precarious form of the Habal-Habal can seat up to thirteen people well as their baggage. In these situations, the motorcycle has extensions consisting of wooden planks placed across the back seat of the motorcycle to create seats for the passengers. Baggage, vegetables, chickens and even goats, are lashed around this construction in strategic places. 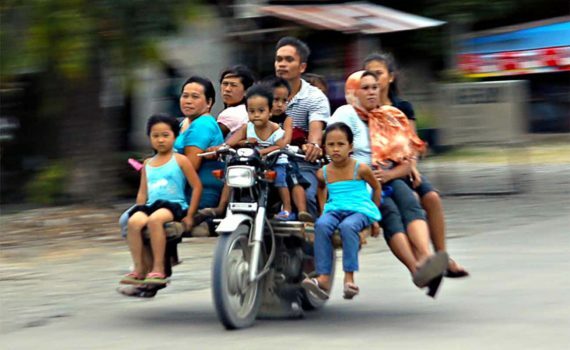 Obviously, this type of transport requires a delicate balancing act between the passengers. Habal-Habal seat extensions often take the form of a T-shaped crossbeam. This has taken on the popular name of a Skylab. How this term was coined is anyone’s guess. Some say it is owing to its crude resemblance to the Skylab space station which orbited the Earth in the 1970s. Others say it is a contraction of the Filipino phrase ‘sakay na, lab’ (‘get on, love!’). Habal-Habal is in greater use in provinces in the Philippines where jeepneys and tricycles can’t handle the rough, steep terrain and narrow roads. A trip on a Skylab is definitely not for the faint hearted: The extended construction doesn’t offer any handles to grasp on to. You have to try to keep your balance by holding the seat or the cargo. Despite its popularity, the Habal-Habal is actually an illegal mode of public transportation. 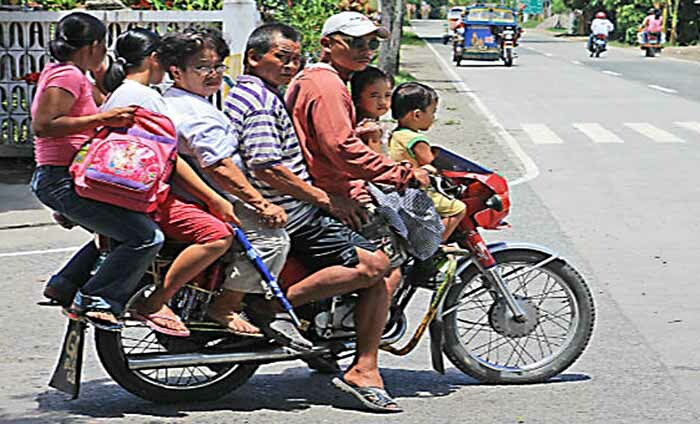 Are there any other speedy but safe inexpensive transportation available on Luzon? 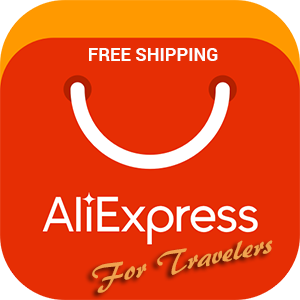 We found the buses and coaches to be the most flexible and inexpensive way of getting around. They are comfortable enough, but can take an age to get in and out of cities due to the chaotic traffic. I always see them with the 2 person Toyota cabs. Never have I ever seen a lot of people hanging on for dear life. But I have only been to Cauayan City, Manila and Puerto Princessa.